I have always loved shopping at the after holiday clearance sales. It’s so much fun to hunt down deals and bargains.Now, as a baking blogger, those sales are irresistible. Decorations and nicknacks for next years care packages? Sounds good! Half priced candy and sprinkles? Count me in! 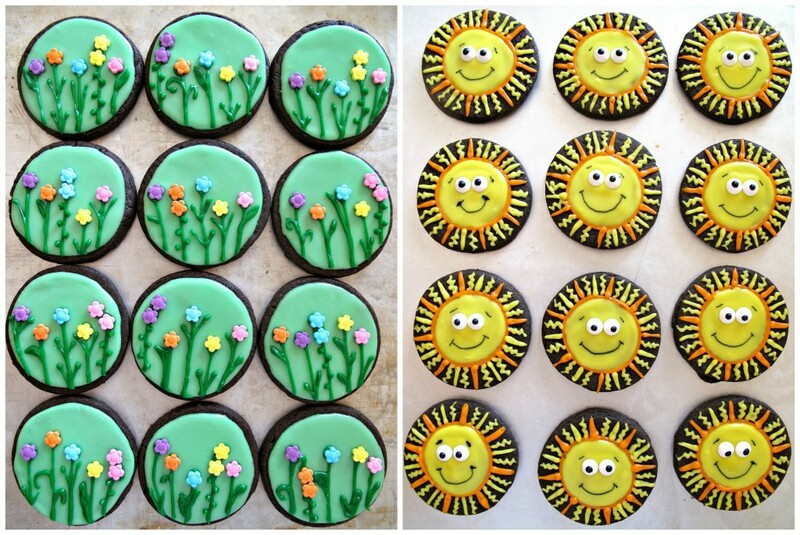 Which is how Spring Flowers & Sunshine Iced Sugar Cookies came to be. When I spotted these daisy sprinkles and candy eyes discounted at World Market after Easter, I knew immediately how I would use them. Chocolate Iced Sugar Cookies decorated with spring flowers and sunshine are exactly as eye catching and easy to make as I imagined. Recently, I stood smiling in front of my sprinkles cabinet (yes, I have a whole kitchen cabinet dedicated to sprinkles.) I had just finished arranging the colored sugars in rainbow order and they looked beautiful. I called my husband over to admire my sprinkles collection. Apparently he wasn’t aware that we had a sprinkles cabinet. When he looked inside his eyes widened as he said,” That’s not a collection. That’s a hoard!” I am a dessert blogger. I don’t care how many colors and shapes of sprinkles I might acquire. It’s a business related collection. Probably. 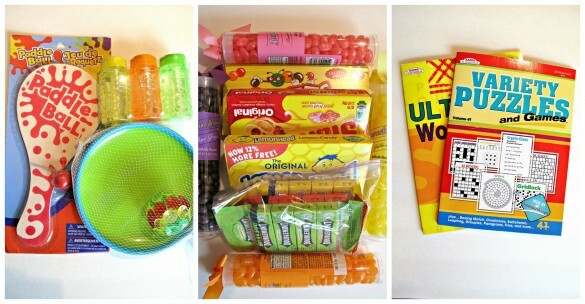 For example, I NEEDED to stock up on the sprinkle daisies and candy eyes so that I could make Spring Flowers & Sunshine Iced Sugar Cookies for this month’s spring time military care package. Flowers and sunshine are what May is all about. These cookies set the theme for a bright and cheery military care package celebrating the season.Though I was lucky to get my cookie decorations on sale, daisy sprinkles are available all year from Wilton or Party City. Part 1 Care Package Contents: My original plan was to simply line the box with sunny yellow wrapping paper, but it looked a bit plain and I wasn’t sure it said,”Spring!” I glued on some clip art I found online to make my intent more obvious. 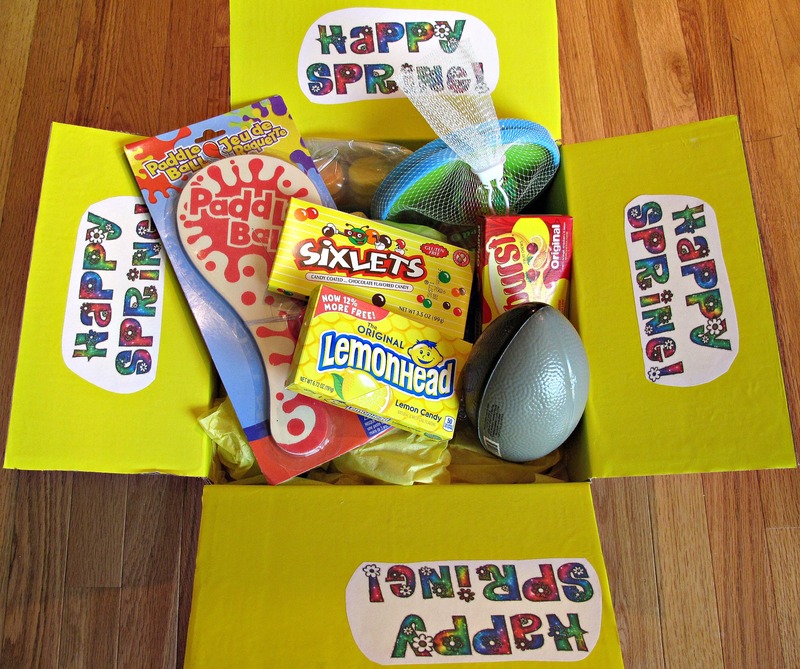 The spring celebration continues with brightly colored boxes of candy (which I hope will not melt), puzzle books, and outdoor toys for de-stressing. I figure that even big, burly soldiers could use some bubbles in their lives. 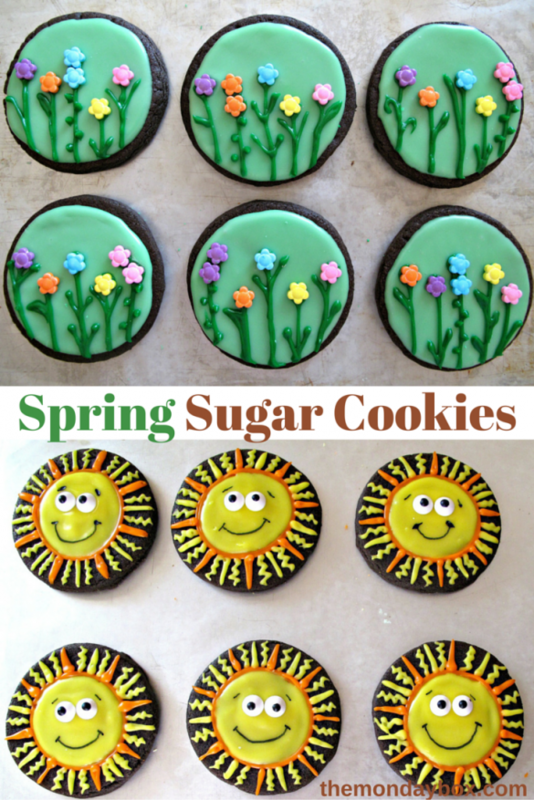 Part 2 Circle Sugar Cookies: Spring Flowers & Sunshine Iced Sugar Cookies are easy to create and are a great design for any spring celebration. 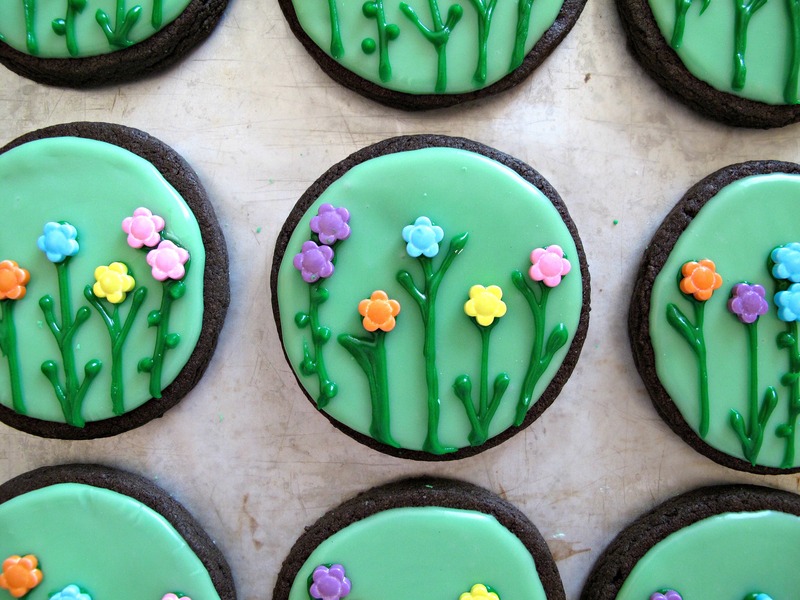 Personally, I plan on giving my mom a bouquet-in-a-box of spring flower sugar cookies for Mother’s Day.One batch of chocolate dough made 32 cookies (16 of each design). I used 2 batches of faux royal icing ( corn syrup icing) and had icing left over, but I found it easiest to divide up the icing for colors with two separate batches. The spring flowers are super easy. Mix the icing to the consistency of white glue. Remove 1/4 cup of icing into a small bowl and color dark green for the stems. Spoon the dark green icing into a piping bag with a small round tip (I used #3). Coloring the remaining icing a lighter green for the background and place in a piping bag with a larger round tip (I used #5). 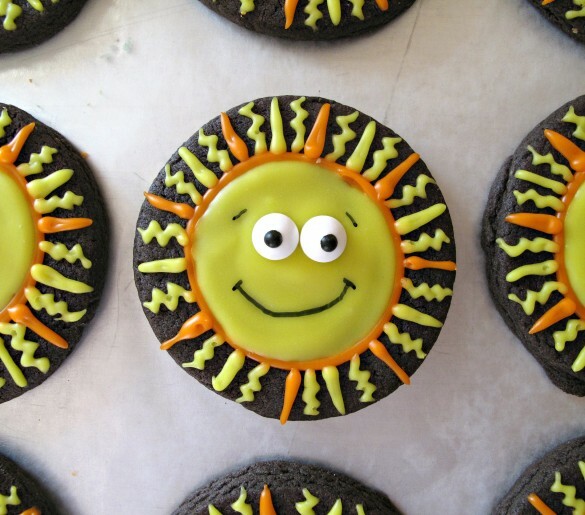 Using the light green icing, outline a circle on top of the cookie, then fill in. Let the background icing firm up slightly (an hour or two)before adding the flowers. Once the icing has dried slightly the flowers can be added without denting or cracking the smooth surface. Use the dark green icing to create stems and leaves. Stick a flower sprinkle on the tip of each stem. 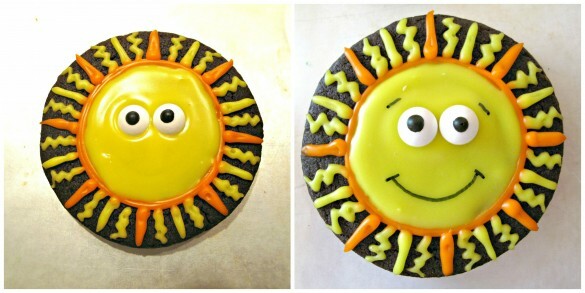 For the sunshine cookies, divide and color one batch of icing into 1/4 cup of orange and the rest yellow. Place the orange icing an a piping bag with a small round tip (I used #3) and the yellow icing into a piping bag with a larger round tip to start (I used #5). 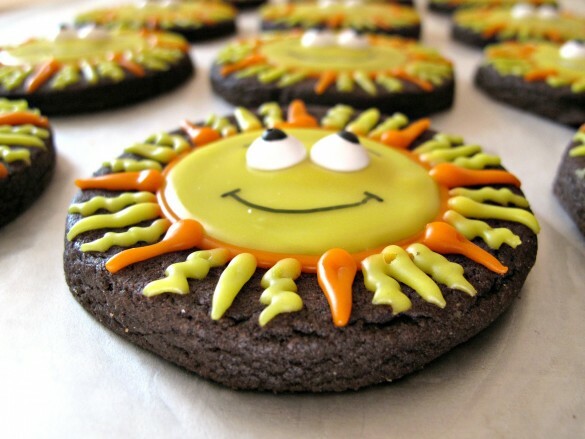 Using the rim of a small plastic container, gently imprint a circle at the center of each cookie. Those who are confident in their freehand circle drawing abilities can skip this step. I need the security of an outline for tracing. Go over the circle outline with orange icing. Allow the outline to dry slightly before filling in with yellow icing and adding the candy eyes. Change the tip on the yellow icing to a smaller circle opening (#3). 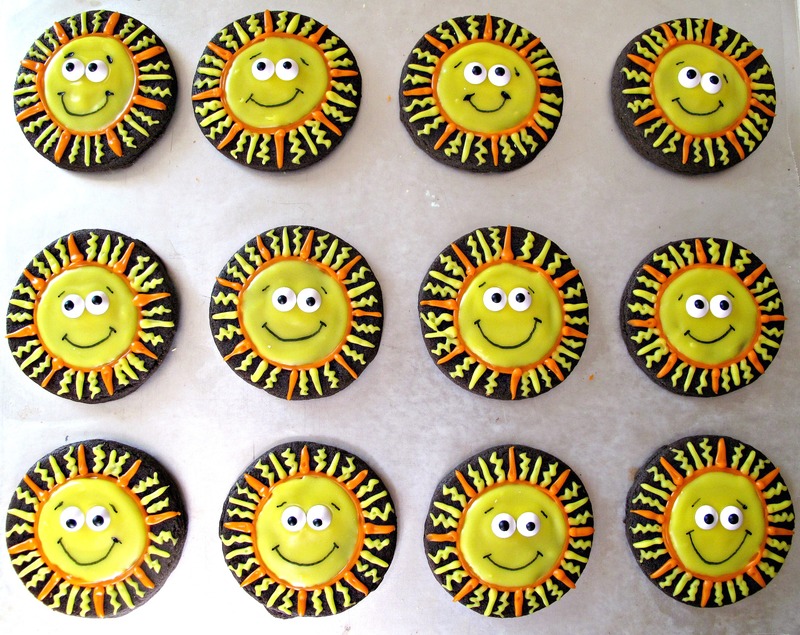 Add straight and wiggly lines with the yellow and orange icing,to create rays of sunshine. When the icing has dried overnight, Use a black food marker (a magic marker with edible ink) to gently draw on eyebrows and a smile. Always air dry iced sugar cookies overnight to allow the icing to harden before storing or packing. For shipping, use plastic wrap to double wrap each cookie before placing snuggly in a column in freezer weight ziplock bags. Part 3 New Recipe: Strawberry Lemonade Bars are the new recipe included in this care package. These soft and fruity bars are bursting with strawberry and lemon. A crunchy top crust gives way to soft chewiness inside. 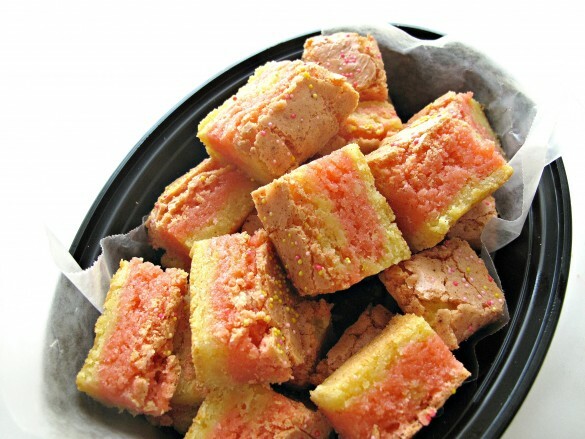 Desert-safe ingredients make Strawberry Lemonade Bars an excellent choice for warm weather care packages. 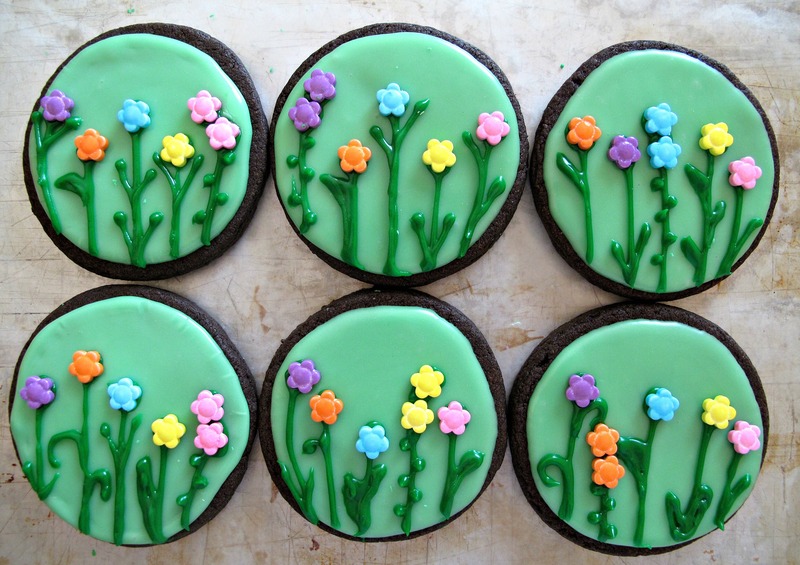 Celebrate spring with some Spring Flowers & Sunshine Iced Sugar Cookies. Whether you share them in person or through the mail, these cookies are sure cause smiles. haha – I really want a sprinkles cabinet, too, now! These cookies are fantastic – love the flowers and they would not have been the same without those marvelous sprinkles, so well done! : ) Have a wonderful Mother’s Day weekend, Wendy! I love that you have a sprinkles cabinet! That made me smile! 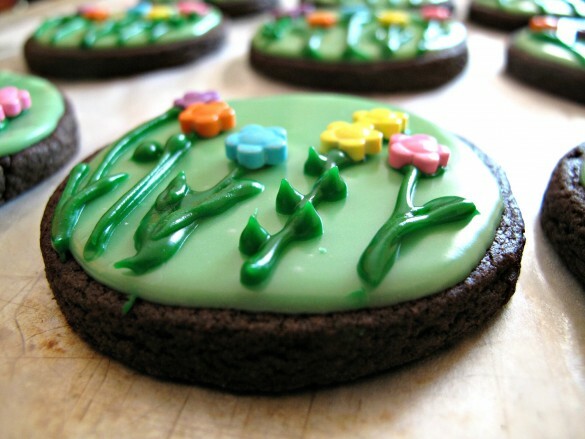 And those daisy cookies I just love! They are so pretty and perfect for this time of the year! Wendy, these cookies are adorable! And you are so thoughtful to take such care for your soldiers. I know they must be so excited when a box comes from you! Oh I can’t wait until your cookbook comes out! Your decorating is inspired and your generosity amazing. Have a wonderful Mother’s day! These are adorable. Tricia, you have the job as my personal cheerleader. 🙂 You are so incredibly supportive. I don’t know about a cookbook, but I do know that I love what I am doing. Recently, I was chatting with a stranger on an airplane. He told me that he had just given a graduation speech. The theme of his speech was, “Don’t just do well, do good.” I try. 🙂 I hope you had a joyful weekend and Mother’s Day! These cookies are GORGEOUS. I am full of awe. I get the hand shakes when icing cookies and then they all look like relatives from a similar family, but not the same. Yours are completely perfect! What an amazing care package! By the way, Party City is one of my favorite places. Along with Target, and Michaels, and well…everywhere that sells baking blogger stuff! Darling! You’ve really outdone yourself this week! Thanks for sharing on Throwback Thursday! Thanks, Mollie!These were made easy with the ready made flowers and the ready made eyes! 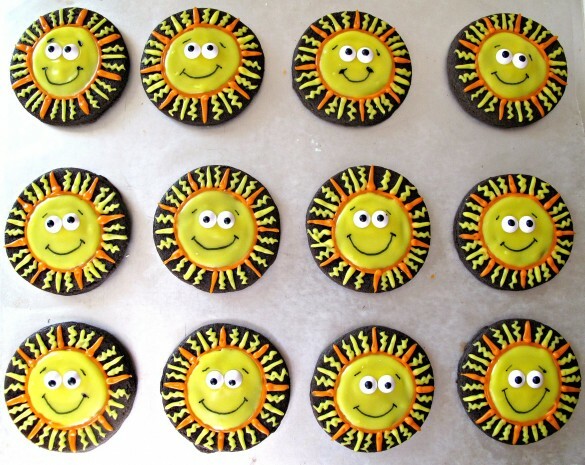 The smiles on the suns make me smile. 🙂 Thanks for hosting Throwback Thursday!